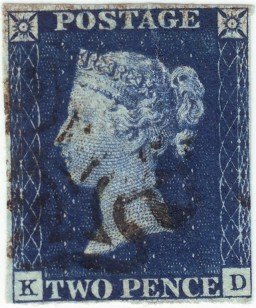 2d Blue stamp lettered K -D, identified as coming from plate 2 using British Line-Engraved Stamps. Twopence Blue. Studies Of Plates 1 to 15 by H. Osborne. Period of use: Plate 2 was completed on July 18th, 1840 and put to press three days later. In daily use, barring Sundays and one other day (18th August 1840) until August 29th, 1840. Cancellation: Maltese Cross cancellation in black (usual on this plate). Ray flaws in the right star which has four shorn rays common to all stamps from this plate - nos. 2, 10, 11 and 12 (counting clockwise). Ray flaw in the left star - missing no. 1 (counting clockwise).